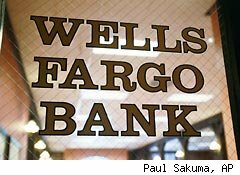 Last week, Wells Fargo (WFC), the biggest name in the nation's reverse mortgage market, announced that it was getting out of the business, citing concerns that housing prices could continue to erode further. That move followed in the footsteps of No. 2 reverse mortgage player Bank of America (BAC), which exited the business earlier this year. 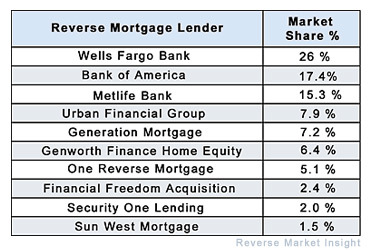 Combined, the two banking behemoths represented 43.6% of the reverse mortgage market, based on a 12-month trailing period ending in April, according to industry researcher Reverse Market Insight. But certified financial planners say it's not the end of the world for cash-strapped seniors who want to stay in their homes. With financial finesse, in some situations, seniors may find non-bank solutions yield better results. John Lunde, president of Reverse Market Insight, doesn't except a stampede of other reverse mortgage lenders will quit the business. He also notes that most of the other lenders hold much smaller slices of the market, with the exception of MetLife Bank, an affiliate of insurance behemoth MetLife (MET). Reverse mortgages are available to homeowners who are at least 62 years old, allowing them to convert a portion of their home equity into cash, receiving either a lump sum or regularly scheduled payments. Borrowers may continue living in their home for as long as they wish, providing they continue paying the property tax and insurance, and maintain the property. Once the last borrower on the loan moves out of the house or dies, the home is sold, the lender collects its money, and any funds that remain go to the borrowers or their heirs. Borrowers, however, have to pay an upfront mortgage insurance premium fee if they are seeking a Home Equity Conversion Mortgage that is offered through the Department of Housing and Urban Development and insured by the Federal Housing Administration. And like a traditional loan, borrowers may also end up paying a loan origination fee and closing costs. With the pool of reverse mortgage lenders shrinking, senior citizens who face a cash flow crunch may have other options available. One option to consider is an intrafamily loan structured like a private reverse mortgage, says Joan Gagnon, a certified financial planner and CPA with Gagnon Wealth Management in Mansfield, Mass. Gagnon is currently working with two adult children of a 70-year-old Massachusetts divorcee on a private reverse mortgage. Come July, she will no longer receive alimony payments and her sole source of income will be Social Security. Although the mother owns her house outright, she will be cash-flow constrained once the alimony stops. The children looked at using a reverse mortgage for their mother, until they learned she would have to pay $20,000 for the upfront insurance costs, Gagnon says. Another remedy discussed was for her to sell her home, move into a trailer home and live off the proceeds from the sale, but she didn't want to sell her house, Gagnon recalled. "I suggested they look into doing a private reverse mortgage. The kids are in their late 40s and 50s and still working, and they have investments. It made sense for them," Gagnon said. Under the arrangement that is currently being finalized, the children will provide their mother with a monthly sum and also cover any major maintenance work the home needs. And because the loan is a private transaction, the debt-to-loan ratio can be 100% if desired, much higher than would be allowed by a bank, Gagnon says. In return, the mother will return the principle plus 5% compounded interest, and repay the funds spent on maintaining the home, once the home is sold after her death. Gagnon notes that all parties involved have also agreed to sell the home if its market value dips below the amount the children have already paid their mother, in addition to factoring in interest owed and maintenance costs covered. Whenever there is a formal loan between related parties, an interest rate, or applicable federal rate, has to be charged. Currently that rate is around 5%. The two children will need to claim the interest rate, or imputed interest, on their tax returns every year, even though the money they will ultimately receive is deferred until the house is sold. With the private reverse mortgage, the children will be receiving a higher interest rate than they would if they left their money in a bank account. And they are ensured they will get their money back, given the terms of the loan are tied to the home's market value. The downside, however, is that the lower home values drop, the shorter the window their mother will have in her home. The house has more than $200,000 in equity so it will likely take years for the mother uses up all of her asset-based loan. But many seniors don't have children who are in a financial position to help bail them out, says John Deyeso, a certified financial planner with Financial Filosophy in New York. Other alternatives for those seniors who wish to remain in their house is to rent out a room to increase cash flow, Deyeso says. Parents could consider doing a lease-back sale, in which a relative or other buyer purchases the home from them, along with a life-long rental agreement. The seller can use the proceeds of the sale to make rent payments back to the new owner, he added, as well as cover their other expenses. Whether its a lease-back or a private reverse mortgage transaction, any senior doing such a deal should hire an attorney to draw up the documents, says Barbara Stucki, vice president of the home equity initiatives at the National Council on Aging. NCOA, which offers a fact sheet on reverse mortgages, has teamed up with HUD and the National Reverse Mortgage Lenders Association to assist seniors who have reverse mortgages and are having trouble making their property tax payments and homeowners insurance. NCOA also operates awebsite called Benefits Checkup that allows seniors to input information about their specific situation and learn about resources and programs available to help them cut their costs. During the past five years, the profile of seniors who are tapping into reverse mortgages has changed. Says Lunde: "Five years ago, before the financial crisis, the typical age of a reverse mortgage borrower was low 70s. Today, it's closer to 62 to 65 years old. More baby boomers are willing to look at mortgages and debt as a way to live the life they like to live."